It’s a reality that every single one of us will eventually be faced with: getting older. Sooner or later, our living situations will need to adjust to accommodate the struggles associated with aging bodies. For those who want to avoid moving into an assisted living facility, remodeling an existing home can be a great alternative. The best possible scenario is to begin these renovation projects before you find them to be a necessity. By renovating before it becomes an immediate need, the changes will be gradual and easier to adjust to, rather than many changes happening all at once. Should mobility become an issue, your current doorways may make it difficult to maneuver. You could find yourself needing to use a walker, wheelchair, or even a mobility scooter which may be a tight squeeze in an average doorway, if it fits at all. Consider making your doorways at least 32 inches wide, which is the minimum to meet ADA accessibility standards. Most doors are fitted with round doorknobs, and we often don’t think twice about the effort it takes to use one. When you take into account the grip and strength needed to open a door one of these knobs, it’s easy to see how difficult it can become if our hands weaken and joints become stiff. An easy solution is to replace all of these doorknobs with lever handles, which are easier to use. This singular room may present the largest undertaking of them all, as there are so many individual projects to consider. You may need to upgrade the bath or shower to one specially made for seniors, install grab bars around fixtures, raise the toilet, install an easier-to-use faucet, and more. With so many potential safety hazards in a bathroom, these projects should be a high priority for anyone who plans to live comfortably in their home for as long as possible. Steps can pose a serious problem for anyone who has limited mobility. Consider replacing any exterior steps with a ramp for easy accessibility. If you have a two-story home, you may need to install a stair lift or even a home elevator. Without these accommodations, getting into and around your home will prove to be a challenge, or even an impossibility. Grab bars aren’t just useful in the bathroom; these can come in handy anywhere that extra stability is needed. If there are any spots where you may need assistance standing or walking, install a grab bar to help. They could be useful by your exterior doorway, long hallways, or anywhere else that you need extra protection from taking a fall. 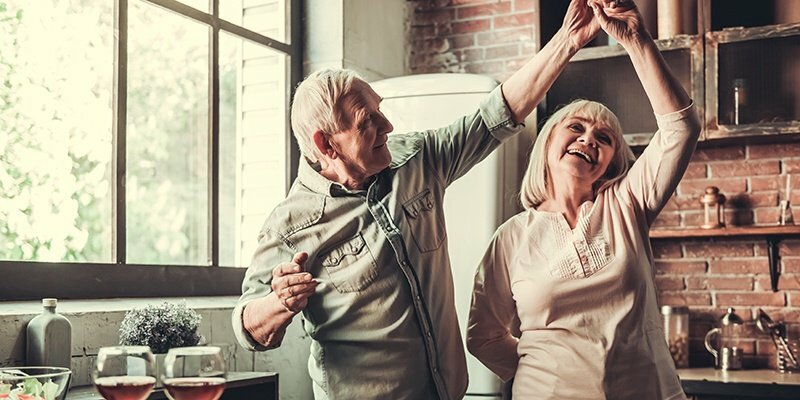 By undertaking some remodels with aging in mind, you can ensure that you’ll be able to comfortably live in your home for as long as possible. If you love the home you already have, these upgrades are a great solution!